The Schuylkill Elder Abuse Prevention Alliance (SEAPA) exists to create greater awareness of elder abuse issues through public education and empathetic victim advocacy. Professor John Hornbrook taught at Penn State University – Schuylkill Campus and became a victim of financial abuse. A perpetual trust was established for each of these organizations. 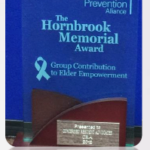 SEAPA honors Professor Hornbrook’s memory annually at a luncheon with the presentation of the Hornbrook Memorial Award to an individual and a group who have gone above and beyond the call to educate the public on elder abuse and to support SEAPA’s ongoing mission. If you know a person or organization deserving consideration as a nominee for this award, download the award application here. Return the completed form on or before March 1 to our award committee. Our vision is to work to develop an ultimate environment in Schuylkill County wherein every resident recognizes, condemns, and strives to eliminate the evils of elder abuse.